Axiom Audio, based in Ontario, Canada, has thrived despite the cooling of the global economy. There are several reasons for this, including their products’ affordability, and a lean business model of selling only via the Internet -- no middleman. Perhaps the biggest reason for Axiom’s success is that they make fine-sounding equipment, something I’ve experienced firsthand with a number of their models. 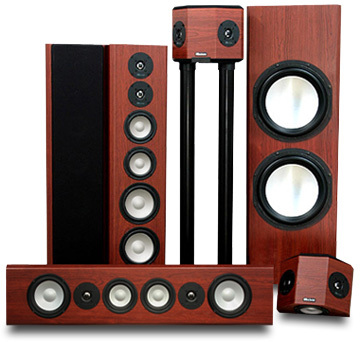 The Epic 80-800 speaker system ($4786.10 USD) reviewed here seemed pretty familiar to me -- a while back I reviewed a similar system, the Epic 80. But the Epic 80-800 includes some new additions to the flagship Epic line -- the VP180 center-channel and the EP800 v3 subwoofer -- and the main and surround models have been designated “v3” to reflect the updates Axiom has made to their crossovers and drivers. With all these changes, it was about time I gave the best that Axiom has to offer another spin. 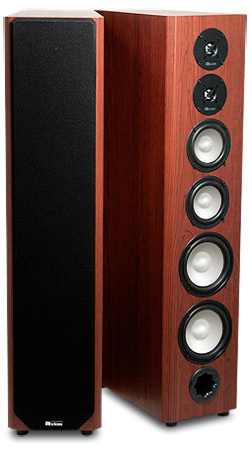 The M80 v3 ($1380/pair) is a large floorstanding speaker nearly 40” tall. When you slide off the M80’s magnetically attached grille, you can see that it means business, and that that business is to play loud. How many speakers do you know that have two tweeters, one above the other? Not any, I bet. In fact, the M80 has two of everything: two 5.25” aluminum midranges and two 6.5” aluminum woofers as well. The purpose of this is to give this speaker the wherewithal to play loudly and cleanly without distortion. The M80 is also highly efficient (95dB/W/m in-room), with a lowish nominal impedance of 4 ohms. Your amp or receiver won’t need a lot of power to drive it up to loud, but it should be rated for loads of 4 ohms or less. Drivers take up nearly all of the M80’s front surface, but Axiom still found room for a port under the lower woofer, and for two more on the rear panel. These ports aren’t simple round holes; each aperture has a jagged rim in a pattern Axiom calls Vortex Porting. This is claimed to effectively increase the size of the port for the given diameter and result in lower noise. Single binding posts are standard; dual binding posts for biwiring or biamping can be had for another $40/pair. The new VP180 ($720 each) is the flagship center-channel speaker of Axiom’s line. I’d thought the VP150 v3 center was big, but apparently it wasn’t big enough -- the VP180’s dimensions are exactly the same as the M80 v3’s. Coincidence? I think not. Other speaker companies often say that this or that center-channel is just like their main speaker turned on its side, when it really isn’t. But Axiom’s VP180 basically is an M80 on its side. It has the same drivers, although in a different, mirrored arrangement: the two 6.5” woofers are on the extreme left and right; between them are the two 1” tweeters, and between them are the two 5.25” midrange drivers. The only other difference is the port arrangement: in the VP180, all three ports are on the back. The four-driver QS8 v3 surround speaker ($558/pair) has a unique configuration: in addition to the top-mounted 5.25” aluminum driver is a second 5.25” driver on the bottom. On each of the speaker’s two angled sides is a 1” titanium tweeter. The result of all this is a speaker that radiates sound in four directions -- an ideal design for a surround speaker that’s to be used where a diffuse soundfield is ideal, but whose tweeters are placed to maximize the specificity of placement of direct sound effects. It’s the best of both worlds. The only problem with a speaker with such a driver configuration is placement -- wall mounting is preferred, as a conventional stand would block the bottom woofer. But if stands are what you prefer, Axiom sells the matching, 38”H FMS QS stand ($290/pair), which has a hole in the bottom specifically for the QS8 v3’s lower woofer. The Epic 80-800 speaker system can be used with a variety of subwoofers, and the one Axiom sent along is their flagship, the EP800 v3 ($2380 each). Another no-compromise, damn-the-torpedoes Axiom design, it’s huge: 45.5”H x 15”W x 17”D. As Axiom explained to me, it had to be this big to get the performance they were after. Most other subs are compromised in the size of their cabinets, amplifiers, or drivers. The EP800 compromises on nothing: it stands 6” taller than the M80 v3 main speaker, and its two 12” aluminum woofers are driven by an 800W amp controlled by a DSP chip that’s programmed to keep the woofers from distorting, and the drivers within 1dB of their target curve. So no matter how loud you play this sub, distortion should be minimized. And with no port, there’s no chance you’ll hear port noise as the drivers move in and out. The amplifier panel on the rear is pretty standard, except for the presence of Sub In and Out XLR connectors. These are dual-function connectors; Axiom provides an adapter so that you can use regular RCA connectors. Axiom calls their standard speaker-cabinet design Anti-Standing Wave (ASW), and it’s used in every speaker in this system. The thinking behind this tapered shape is that these cabinets’ asymmetrical sidewalls will break up soundwaves emanating from the rear of the driver after they’re reflected off the back cabinet wall. This means that these soundwaves have less of a chance of muddying the direct sound from the drivers themselves. Although some manufacturers make drivers of such exotic materials as beryllium-infused gold or ceramic-deposited aluminum, all of the drivers in Axiom speakers are made of more common metals: the 1” dome tweeters here are made of titanium, the midrange drivers and woofers of aluminum. This is in keeping with Axiom’s value-oriented thinking; pure metal is time-tested, and exotic materials are expensive and require significant investment in R&D. Except for the EP800 v3 subwoofer, all of the Epic speakers were finished in a Black Oak vinyl veneer with a nice, smooth grain. The EP800 v3 was finished in a rich Black Piano Gloss that put it a few notches higher on the scale of class. 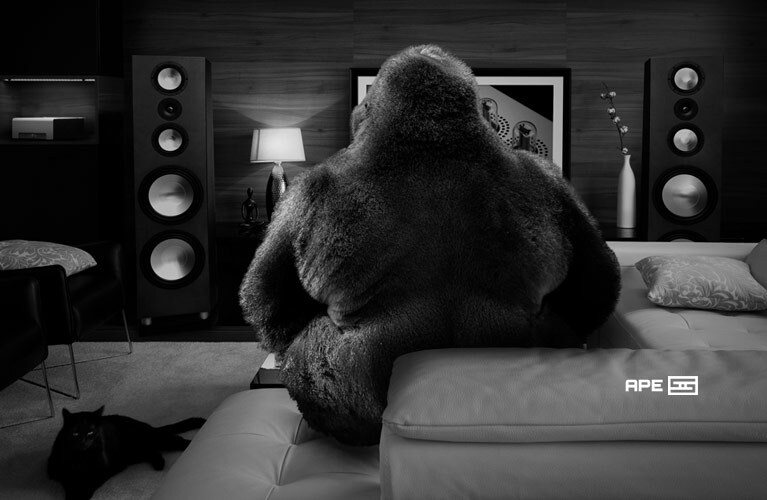 And the degree of customization possible with Axiom speakers is almost unprecedented. Clicking on the “Customize Yours” link on the M80 v3’s webpage brings up no fewer than five options: finish, grille color, rear speaker label, type of feet (rubber, spiked, etc. ), and single or biwire inputs. But be cautious when customizing -- you can easily double a system’s cost. Axiom Audio’s Epic 80-800 home-theater speaker system was set up in my basement room, which measures 23’L x 16’W x 8’H. My 92” screen is set up along the long wall, and I sit 10’ from the front left, center, and right speakers. The surrounds were behind me and to the sides, about 5’ away. The EP800 v3 subwoofer was a bit of a beast to place; the best spot was about 2’ to the left of the left front speaker. The automatic room-calibration software in my Integra DTR-8.8 A/V receiver designated the front left, center, and right speakers as Large and the surrounds as Small, with a crossover of 80Hz. When I settled in to listen to the system, the first thing I thought was Wow -- this system can play loud! In the many sonically rich scenes in the Blu-ray version of Inception -- such as at the beginning, when Cobb is in Saito’s dream -- wide dynamic range was in abundance. It wasn’t just loud, but it was remarkable how cleanly the system played through my A/V receiver without the need for a big external amp. Contributing to this, of course, was that huge EP800 v3 subwoofer. Curious, I turned off the sub to get a sense of what the rest of the system could do on its own. Again, my reaction was Wow! The energy produced by just the five speakers was impressive. Although the sound pressure level was a few notches below that of the entire system with sub, the three big speakers up front were contributing a lot, rattling fixtures and shaking the walls. Looking back at my review of Axiom’s Epic 80, I was reminded of how good that system’s coherence was. Unsurprisingly, the Epic 80-800 was similarly good in that regard. The big difference between the two systems was their center-channel speakers, the new VP180 replacing the old system’s VP150 v3. The VP180’s driver arrangement abandons the VP150’s odd configuration of tweeters at the cabinet’s extreme left and right ends. The VP180 basically sounded exactly like the M80 v3, only in a horizontal orientation. It’s not easy to make a horizontal speaker sound like a vertical speaker, with all of the drivers interacting differently in each configuration. Kudos to Axiom’s design team for doing just that. From the VP180 I heard unusually good dialogue intelligibility and rich male voices. Robert Downey Jr. mumbles his lines throughout the Blu-ray edition of Sherlock Holmes; with a poorly designed center-channel speaker, this means a frustrating evening of reading subtitles. But with the VP180 the sound was clean -- I never had to strain to understand what was going on. If my recollection is correct, the VP150 v3 sounded slightly recessed in comparison to the forward presentation of the M80 main speakers. The new VP180 exactly matches the forwardness of the new M80 v3, for a better side-to-side match up front. The M80 v3 was tonally well balanced throughout the audioband. I heard no frequency anomalies at all, although the M80 v3 was such an honest speaker that it could ruthlessly reveal poor recordings. The soundstage of the M80 v3s tended to be up front, giving me a close “view” of performances, such as those on Patricia Barber’s Nightclub (SACD/CD, Mobile Fidelity Sound Lab USACD 2004). In fact, the imaging of the pair of M80s was so good that, when listening to two-channel recordings, I often thought the VP180 center-channel was engaged. Although the QS8 v3 is Axiom’s best surround speaker, it doesn’t match the sheer size of the other models in this system. However, you can compensate for their relative smallness by using the bass management of your processor or receiver to set the subwoofer crossover to 80Hz, which shunts everything below that frequency to the sub. Then the QS8 v3 can do its thing, which is to reproduce both discrete and diffuse surround sounds equally well. This is rare among surround speakers, which tend to excel at one or the other of these aspects, but not both. With Inception, the QS8 v3s were able to both immerse me in the soundfield and re-create the various sonic environments the characters found themselves in, as well as accurately pinpoint discrete effects such as the sounds of exploding plates. The EP800 v3 subwoofer took the Epic 80-800 system over the top. I had never before heard a subwoofer in my system that could put so much energy into my room. The numerous explosions, falling buildings, and gunshots in Inception had a weight and depth of bass that were clearly better than from any other subwoofer I’ve had in my room. This subwoofer was so good, it left me begging for more. I spent an evening pulling out all my best-bass Blu-rays, from Iron Man to Fight Club, just to hear the EP800 v3’s sheer power. Its level of performance was intoxicating, and left me shaking my head in disbelief. I’ve heard in my house a few speaker systems of comparable price to the Axiom Epic 80-800, and the closest was Paradigm’s Monitor 11 v.6-based system ($4274). Like the Axiom, the Paradigm is a high-efficiency system capable of high sound levels, and has an outrageously large center-channel speaker, the CC-390 v.6. Also like the Axiom system, the Paradigm included compact, multi-driver surround speakers: the ADP-390 v.6. The biggest difference was in the size of the subwoofer; Paradigm’s system came with their UltraCube 12, which looks like something the Axiom EP800 v3 could give birth to. The systems’ sounds differed in several areas. Axiom’s QS8 v3 reproduced both discrete and diffuse effects with aplomb, but Paradigm’s ADP-390 v.6 was better suited to diffuse effects, with slightly less directionality when that was needed. When I watched the Blu-ray edition of The Dark Knight, the sounds of shell casings hitting the floor were easier to hear through the Axiom surrounds than through the Paradigms. Tonally, the Paradigm Monitor 11 v.6 was similar to the Axiom M80 v3, if not as revealing. The Paradigms’ imaging was as good as the Axiom M80 v3s’ -- remarkable for two such large speakers. Where the Paradigm system surpassed the Axiom was in its center-channel: The CC390 v.6’s raised tweeter is superior to the VP180’s tweeter for off-axis listening. Listening to the VP180 from the extreme sides of my room, I could hear the high frequencies being rolled off, something that just doesn’t happen with the Paradigm center. I’ve found that this trait is always present, to some degree, with horizontal D’Appolito-like driver arrays. However, if you’re seated within a 90-degree arc in front of the Axiom VP180, this won’t be an issue. If you’re after high SPLs in your room, you’d be served equally well by either system. However, the EP800 v3 sub takes the Axiom system to another extreme. To match this level of performance in Paradigm’s line, you’d have to ascend to their Reference line and spend quite a bit more. Axiom Audio’s Epic 80-800 home-theater speaker system brings phenomenal performance to the masses. It can play at concert-level loudness without requiring costly, high-powered amps -- a remarkable achievement. This system gets my highest recommendation. If you have the space, and desire a system that can blow you away, order the Epic 80-800 and take advantage of Axiom’s generous return policy. But I don’t think you’ll be returning this system.